Long ago, young boys helped in the village by watching the sheep. While men and women in the village did other work, the boys would take all of the sheep from the village up to the mountainside to eat the sweet grass. A boy watching the sheep was given a special horn. "Only blow the horn if you are in danger," he was told. One of the younger boys got tired of watching the sheep and lambs run around and decided to play a trick on everyone. He blew on the horn and shouted, "Wolf! Wolf! 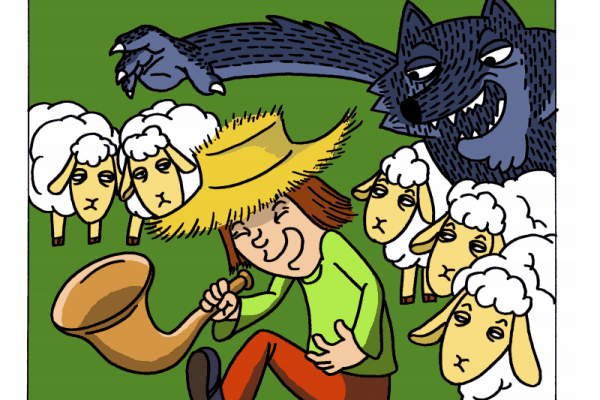 The Wolf is after the sheep!" The men and women ran up the hill to help the boy chase drive the wolf away. When they got to the top of the hill, there was no wolf. There was only the face of a young boy who laughed at the angry villagers. "Don't cry 'wolf'," said the villagers, "if there is no wolf!" The angry men left and went back down the hill. Later, the boy again blew the horn he had been given and for the second time yelled, "Wolf! Wolf! The wolf is after the sheep!" Again, he watched the men run up the hill to help him chase the wolf away. When the villagers saw that the alarm was not real, they wee angry. "Save your alarm for when there is really something wrong! Don't cry 'wolf' when there is NO wolf!" The boy just smiled and watched them go grumbling down the hill once more. Later, he saw a REAL wolf coming close to the flock. He leaped to his feet. "Wolf! Wolf!" he cried as loudly as he could. The villagers thought he was trying to fool them again and did not come. Later that night, everyone wondered why the shepherd boy hadn't returned to the village with their sheep. They went up the hill to find him crying. "There really was a wolf here! The flock has scattered! I yelled, "Wolf!" Why didn't anyone come?" "We'll help you look for the lost sheep in the morning," they said. "Nobody believes a liar...even when he is telling the truth!"